lets say youve got a 450 hp sbc and your looking for a decent mechanical fuel pump, the choice is between two in your catalog , one pumps 35 gallons per hour and one pumps 80 gallons per hour, but costs a bit more, so you want to know if the smaller pump will work? The average advertised weight of a gallon of premium fuel is 6.34 lb/gallon. Brake Specific Fuel Consumption or B.S.F.C. Brake Specific Fuel Consumption or B.S.F.C. is the amount of fuel required to produce 1 HP for 1 hour. This means that an engine with a B.S.F.C of .5 will burn 1/2 or .5 lbs of fuel to produce 1 HP for one hour. 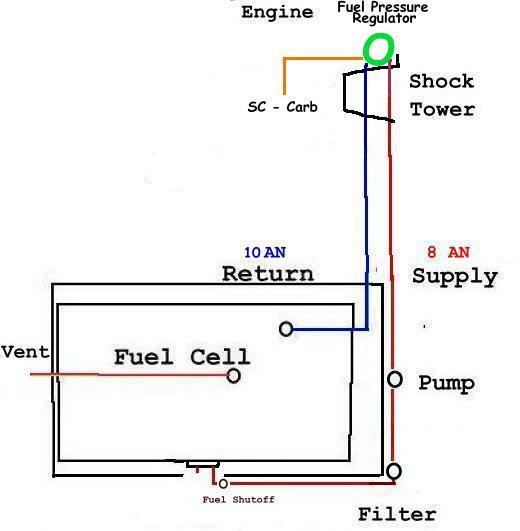 Determining exact B.S.F.C for a specific engine is complicated and requires an engine dyno. but remember pump losses, and a fuel pressure regulator and a return line fuel feed system designs flow requirements ? Last edited by grumpyvette; 04-14-2010 at 07:17 AM. What engine would you chose for an engine swap? Carbs or fuel injected?